Scientists offered two reasons for the rise in methane production in Mars - geological processes or life. A European orbiter has confirmed Monday that there has been increased production of methane – a gas that is typically produced by living organisms on Earth – in Mars and raised the possibility that living organisms could have produced them in another planet. The possibility of an alien life form in Mars has been a subject of multiple operations by the different space programs around the world. In Nature Geoscience on Monday, scientists working with the European Space Agency’s Mars Express orbiter reported that in the summer of 2013, the spacecraft detected methane within Gale Crater, a 96-mile-wide depression near the Martian equator. “Our finding constitutes the first independent confirmation of a methane detection,” said Marco Giuranna, a scientist at the National Institute for Astrophysics in Italy, in an email. Dr. Giuranna is the principal investigator for the Mars Express instrument that made the measurements. According to researchers, the methane gas in the Martian atmosphere is most likely to have been created recently because gas decays quickly and have relatively low half lives. Calculations indicate that sunlight and other chemical reaction in the thin Martian atmosphere would break up the molecules within a few hundred years. The researchers suggest that methane gas in Mars could have been created by a geological process called “serpentinization.” Or it could be a by-product of life – specifically methanogens. Methanogens are microbes that release methane as waste and thrive in places with low oxygen, such as underground rocks and digestive tracks of animals. The hopeful scientists argue that even if the methane were not produced by life, the hydrothermal systems in a geologic process that created the methane emissions would still be a prime location to search for signs of life. Interestingly, the data confirmed by ESA coincided by the data reported by NASA’s Curiosity rover that has been exploring that region since 2011. NASA has noted a significant rise of methane in the air in the summer of 2013, too, that lasted for about two months. 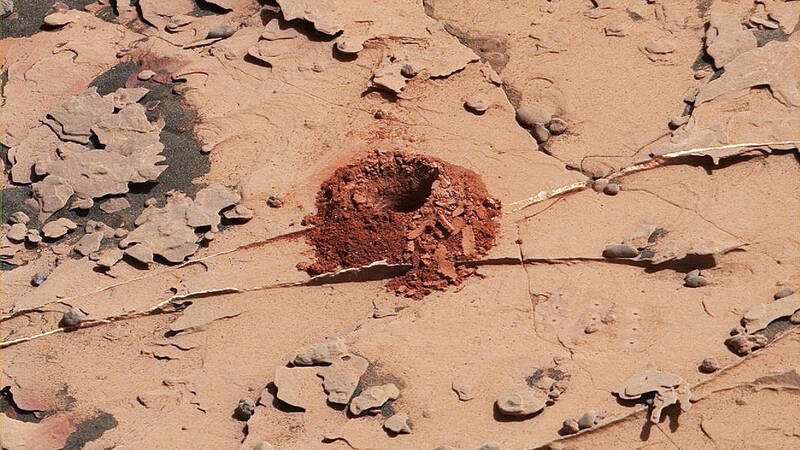 “It reaffirms the hypothesis that Mars is presently active,” said Sushil Atreya, a planetary scientist at the University of Michigan and a member of the Curiosity science team. Only recently, a new European Mars spacecraft, the Trace Gas Orbiter, with a more sophisticated methane detector has been in orbit since 2017, but no results have been reported by far. The search for life in Mars had also seen a fresh hope when a group of scientist also discovered what they thought is micro-organism in Mars. A group of researchers has published in the Journal of Astrobiology and Space Science Reviews a paper saying that they may have found evidence of life currently living in Mars. The researchers argue that a fungus-like ‘growth’ found on Mars is indicative of a microbial life that could have been existing in the planet. The paper cites their observations of the photos taken by the retired Opportunity Rover. The left panoramic camera captured the image below on Sol 37 (37th Martian day), showing lobes that may be lichen growing on Mars. Images taken by Opportunity Rover supposedly depicting lichens in Mars. The authors of the paper offer the varying amount of methane in Mars as additional proof to their discovery. They said that the fact that there are measurable differences in the amount of methane in the atmosphere based on the season adds credibility to the claims of microbial life’s existence on Mars. The researchers hypothesized that this phenomenon is like “breathing” for the planet. It exhales methane when things warm up, and the supposed life wakes up; and when it gets cold in the fall/winter, life ‘goes to sleep’ or is otherwise less active, resulting in lower methane. Nonetheless, the researchers admit that their study was inconclusive and more discoveries should be made to confirm their hypothesis.